THE HOCKEY SCHTICK: Did Greenland & W Antarctic Ice Sheet Loss Suddenly Double? Did Greenland & W Antarctic Ice Sheet Loss Suddenly Double? World's Largest Ice Sheets Melting at Fastest Rates in Recorded History! But what does the paper actually show? The paper compares ice volume changes between three different satellite altimetry databases. As the authors note, one must be very careful about drawing conclusions in comparing databases from different measurement sources and which use different analysis methods. In this case, the CryoSat satellite database only covers a very short 2011-early 2014 time period of a little over 3 years and does not overlap the ICESat database from 2003-2009 or the IMBIE database from 2003-2008. Therefore, the CryoSat database cannot be directly calibrated against the other two databases and comparisons must be done with caution. and does show an increase in volume loss of 296 km^3yr-1 between the 2003-2009 ICESat database and the short 2011-2014 CryoSat database. Regardless of all the caveats of comparing these short, non-overlapping datasets, if we assume the numbers are true, what is the significance? According to the IPCC, the Greenland + Antarctic ice sheets contain a total of 27.6 x 10^6 cubic km of ice, equivalent to 63.9 meters sea level rise. If this paper is correct, the combined ice sheets are losing 503/27600000 or 0.0018% of their mass per year, equivalent to 1.16 mm/yr sea level rise or 4.5 inches per century, hardly alarming, and almost exactly what the IPCC 2013 report claimed for the sea level rise contribution of 0.6 mm/yr from Greenland and 0.41 mm/yr from Antarctica, a total of 1.01 mm/yr. 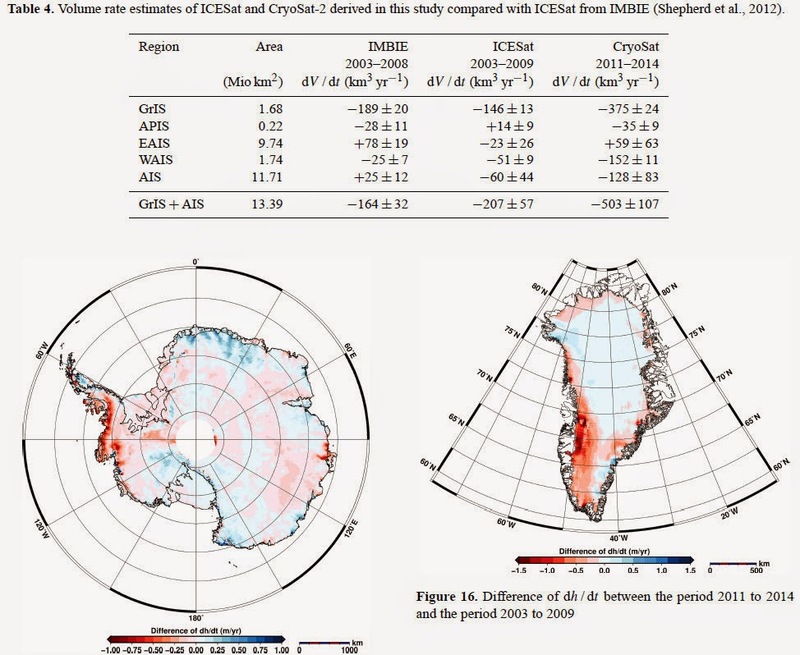 A paper also published this week contradicts the claims of increased ice loss from the Antarctic Peninsula and finds the melt rate has instead decreased since 1993. Further, if there was an actual doubling of ice loss from Greenland and Antarctica, that should have been found in a corresponding acceleration of sea level rise. No such acceleration has been found and Cazenave et al and Chen et al have instead found a recent deceleration of sea level rise, the opposite of what would be expected if the ice sheets had accelerated ice loss. In addition, worldwide glacier melt has decelerated since 1950, also the opposite of predictions of AGW theory. During an interglacial period sea levels normally rise and ice melts, and the system inertia lasts thousands of years until the onset of the next ice age. During the last interglacial, sea levels were up to 43 feet higher and Greenland was 8C warmer with a much smaller ice cap; there is no evidence this interglacial is any different. There’s no evidence of acceleration, therefore no evidence of anthropogenic influence on sea level rise for the past 20,000 years. Global temperatures have "paused" for the past ~18 years, another reason why Antarctic and Greenland ice loss could not have doubled within the past 5 years. The areas that show ice loss in the figure above are also located above volcanically active areas in Antarctica as well as volcanically active areas in Greenland, but not related to man-made CO2. UPDATE: In addition, a recent paper published in the Journal of Glaciology finds that ice accumulation of the interior of Greenland has increased 10% over the past 52 years, offsetting runoff from some outlet glaciers along the periphery. According to the authors, "this implies that the increased water vapor capacity of warmer air is increasing accumulation [of ice] in the interior of Greenland." Abstract. This study focuses on the present-day surface elevation of the Greenland and Antarctic ice sheets. Based on 3 years of CryoSat-2 data acquisition we derived new elevation models (DEMs) as well as elevation change maps and volume change estimates for both ice sheets. Here we present the new DEMs and their corresponding error maps. The accuracy of the derived DEMs for Greenland and Antarctica is similar to those of previous DEMs obtained by satellite-based laser and radar altimeters. Comparisons with ICESat data show that 80% of the CryoSat-2 DEMs have an uncertainty of less than 3 m ± 15 m. The surface elevation change rates between January 2011 and January 2014 are presented for both ice sheets. We compared our results to elevation change rates obtained from ICESat data covering the time period from 2003 to 2009. The comparison reveals that in West Antarctica the volume loss has increased by a factor of 3. It also shows an anomalous thickening in Dronning Maud Land, East Antarctica which represents a known large-scale accumulation event. This anomaly partly compensates for the observed increased volume loss of the Antarctic Peninsula and West Antarctica. For Greenland we find a volume loss increased by a factor of 2.5 compared to the ICESat period with large negative elevation changes concentrated at the west and southeast coasts. The combined volume change of Greenland and Antarctica for the observation period is estimated to be −503 ± 107 km3 yr−1. Greenland contributes nearly 75% to the total volume change with −375 ± 24 km3 yr−1.